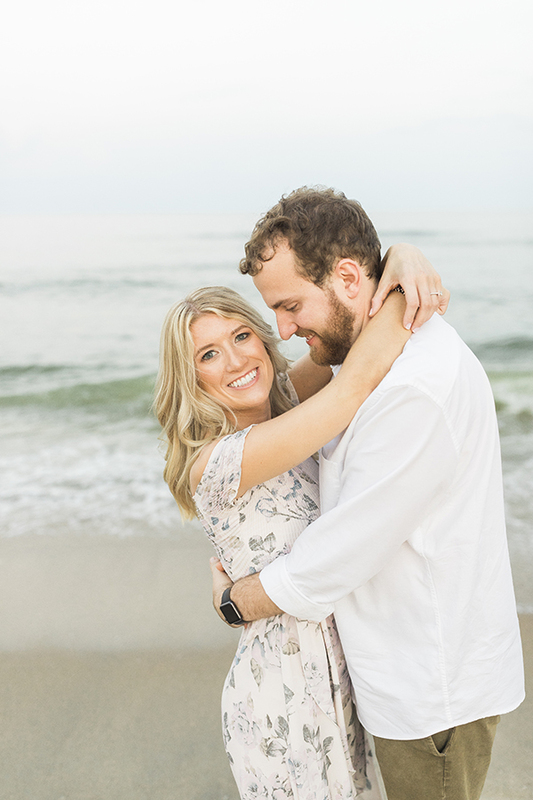 How about a super sweet engagement session to kick off the week? 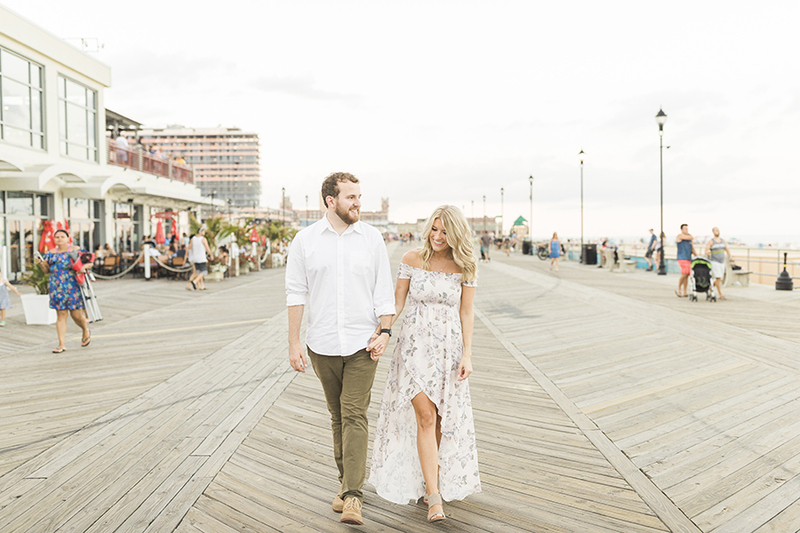 You might recognize Megan and Jeffrey’s engagement session from our recent Spring 2019 edition…but today, we’re sharing more from their Asbury Park e-session. 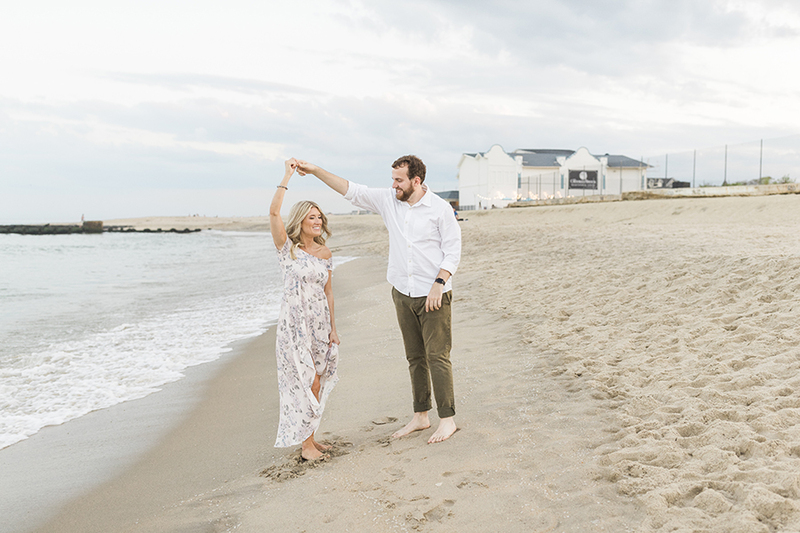 It’s a fun engagement shoot that starts with a little Coney Waffle indulgence, followed by a walk on the boardwalk, and ends on the beach with the most romantic sunset. (Those cotton candy skies will never get old!) 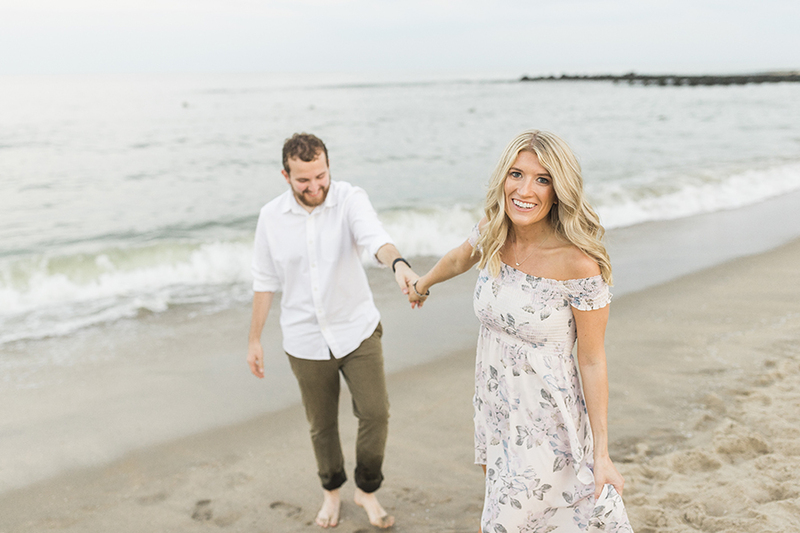 With Kelly Sea Images behind the lens, you can expect some incredible natural light, authentic moments, and a whole lot of love. 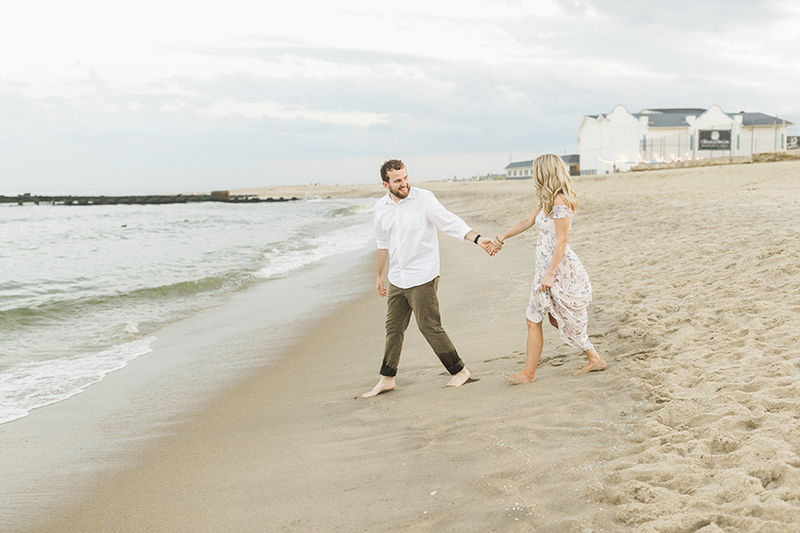 Take a peek at all our favorite images from this New Jersey engagement session below. We promise it’s a good one you don’t want to miss! 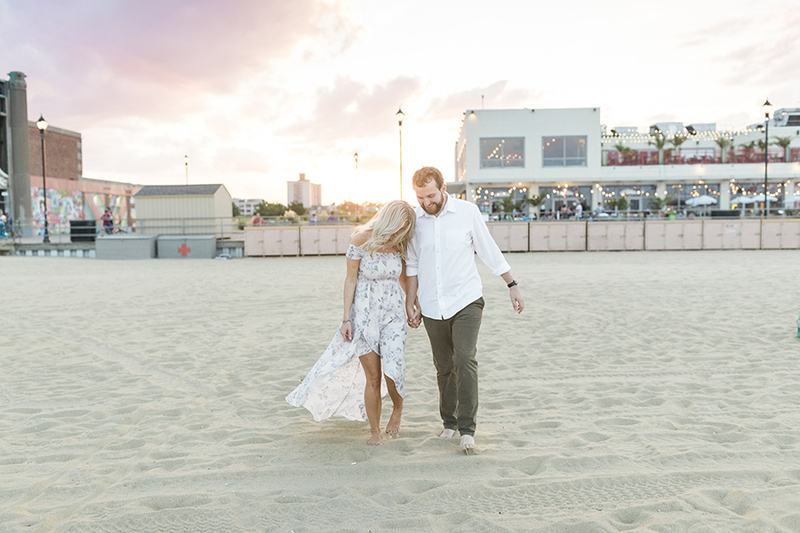 From Kelly Sea Images…Photographer dreams are made of engagement photo sessions at Coney Waffle. As a preface, I love ice cream more than the average person. Before I became a photographer, I actually worked in an ice cream parlor for many (many) years. People always tell you that you will ‘get tired of ice cream’ when you work in a place like that, but alas it never happened. It truly only made me more picky about my desserts, and I remain disappointed nearly a decade later that any time I go to get ice cream I am not allowed to make my own sundae. As you can imagine, I have very high standards for frozen confections, and believe that presentation is important. I just want to throw it out there that Coney Waffle’s execution is exemplary. They really pride themselves in their ice cream, and I can get behind that. 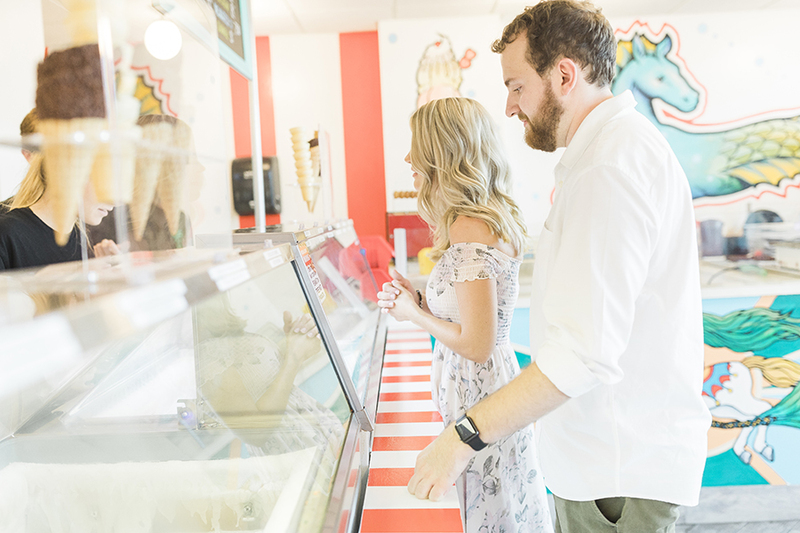 Megan and Jeff obviously have excellent taste, because they chose this location for their engagement session. Then, they also chose one of the most monstrous concoctions for us to do photos with/eat. 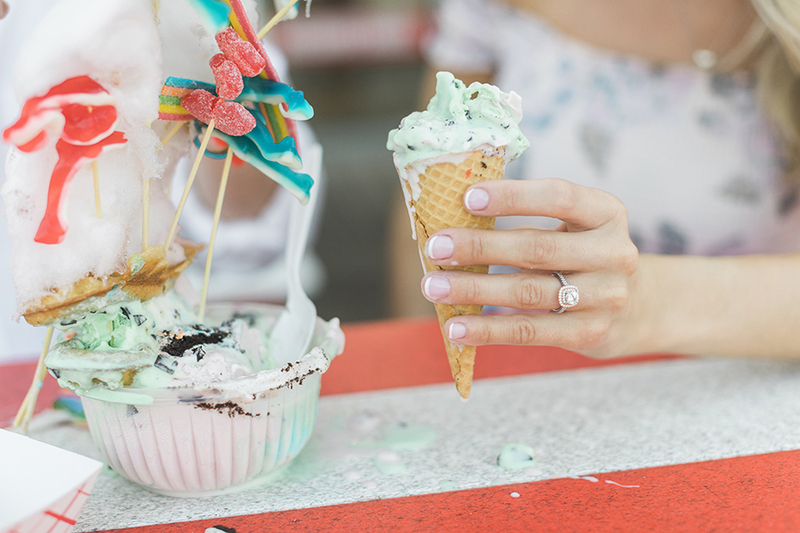 I truly appreciate the fact that Megan let me put her ring in cotton candy and ice cream multiple times, all for the sake of amazing photos. 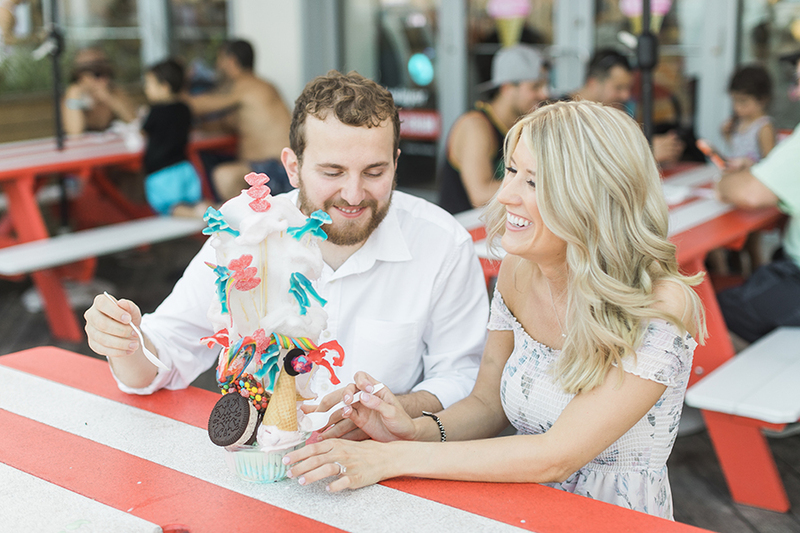 There were also gummy sharks in the sundae, and I just so happen to be a gummy shark addict. 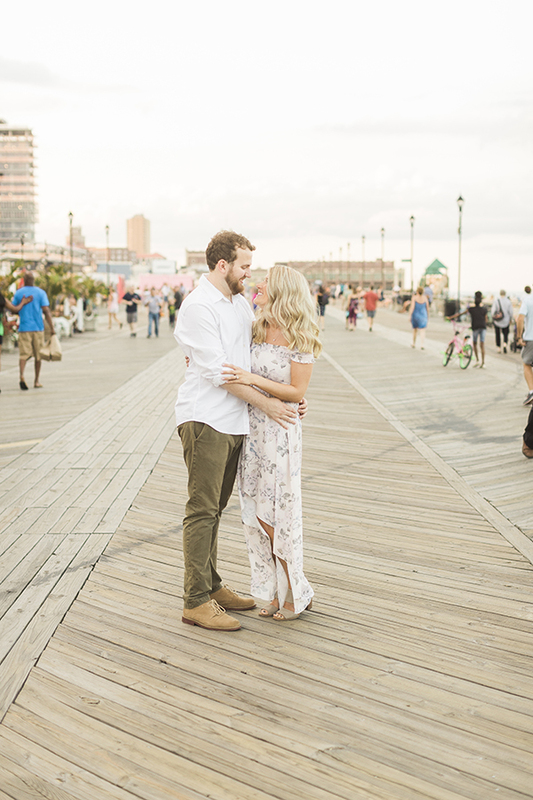 After our Coney Waffle excursion, we did a couple of photos on the boardwalk and then headed down onto the beach – where we got a sunset that legit looked like the cotton candy in the sundae we just ate. Does it really get any better than that?! Oh wait! Yes it does! It also just so happened that we were doing the photos on the night when Ziggy Marley was playing the Stone Pony Summer State, so we literally got a built in concert for this session as well. We met when we were teenagers both working at our local A&P supermarket. We were friends for over a year before we started dating in 2012 and have been together ever since! We both share a mutual love of ice cream, cheese and cats. We love spending time outdoors – hiking, at the beach or just taking a walk around our neighborhood. We support each other in so many different ways. Jeff is a nurse and I am a teacher and our jobs take a lot out of us. It’s such an amazing feeling to be able to have someone in your life who you are genuinely excited to see at the end of a long day, every day. Things aren’t always perfect, but we are truly best friends and I can’t imagine life without Jeff. On December 23, 2017 we took the train to NYC for our annual Christmas trip. It was pouring rain and we were walking towards Central Park when Jeff told me he had gotten us a horse carriage ride as a surprise gift. As we were riding through the park being pulled by our horse Kevin, our driver suggested we get out at Bethesda Fountain to take some pictures. I said, “No, that’s okay,” not wanting to get soaking wet but Jeff seemed to think it was a good idea so I went with it. As soon as we reached the fountain, Jeff got down on one knee and proposed. I, of course, said YES! and the rest of the day was spent walking around the Natural History Museum, Jeff looking at the exhibits and me staring at my ring. We finished the night at a pub eating burgers and drinking champagne and headed home on the train engaged. 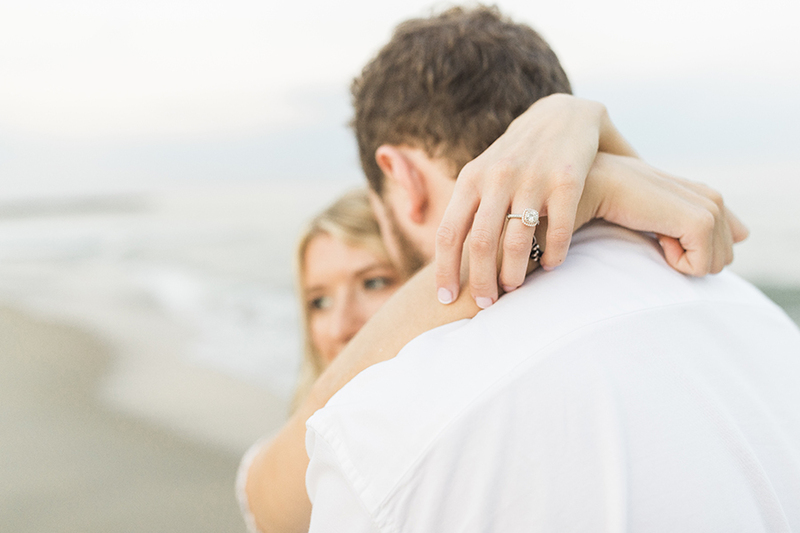 I love rose gold jewelry but didn’t want a ring that was entirely rose gold. 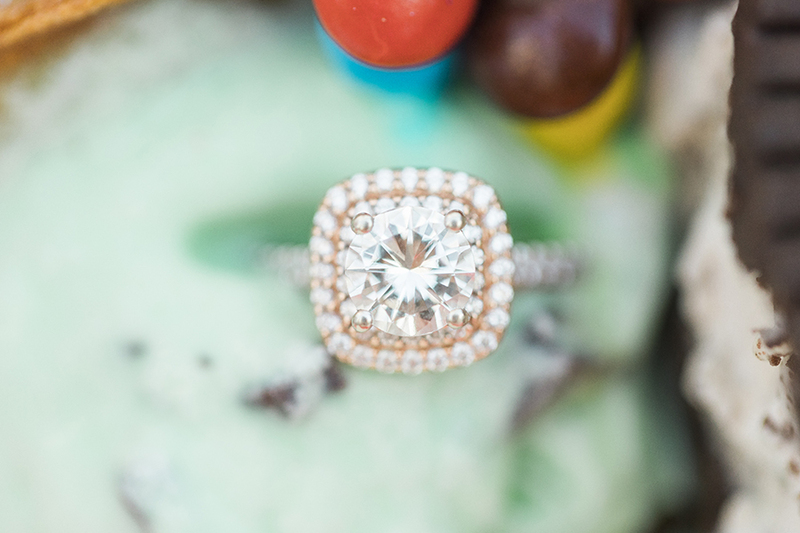 It is a double halo with rose gold around the halos and white gold around the band. The diamond actually was from my mom’s engagement ring so it is extra special to me. 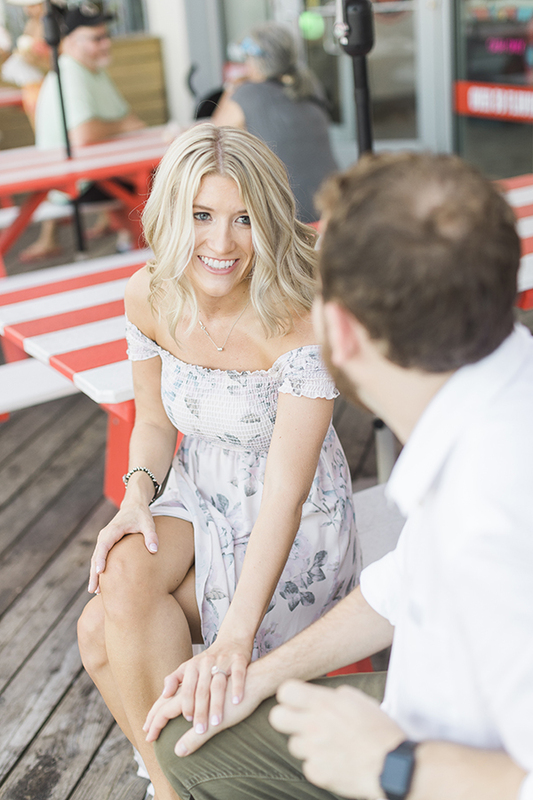 We are having a backyard summer wedding – July 20, 2019. My grandmother has so much land and we are renting a giant tent and having the ceremony and reception all in one place. Her house is the same house my mom and her seven siblings grew up in and it was such an important place in my childhood. 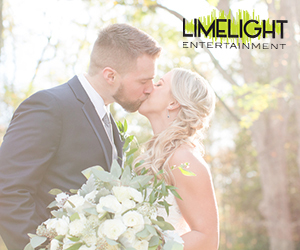 My grandfather always said he wanted to live long enough to dance with me at my wedding, and while he is no longer with us, I know he would be so happy to know we are getting married in front of his garden surrounded by all of our family and close friends.